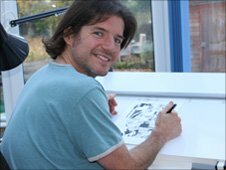 Shrewsbury illustrator Charlie Adlard has been celebrating after inspiring a new, live-action TV series, based on one of his comics. 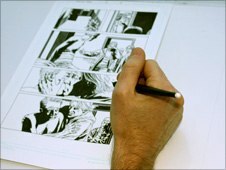 Mr Adlard started drawing for The Walking Dead in 2004, after the author contacted him from America. The TV series has been backed by Shawshank Redemption director Frank Darabont. It launched on UK digital channel FX on 5 November and a second series has been commissioned by US network AMC. Based at his studio in Shrewsbury, Mr Adlard has illustrated issues for some of the world's most popular comic titles, including X-Files, Judge Dredd and Shadowman. Mr Adlard said the e-mail from writer Robert Kirkman, asking him to draw for The Walking Dead, came out of the blue. He had met Mr Kirkman a couple of times in America, but had not heard of the comic book. He said it was a bit of gamble: "Our career was entirely dependent on how well the comic did and whether we got paid or not. If it didn't sell, we didn't get paid anything." The option on The Walking Dead was taken up by Hollywood director Frank Darabont, but for several years nothing happened, and the option lapsed. Then Mr Darabont, also responsible for the movie The Green Mile, proposed a six-episode television series based on the stories. Charlie Adlard said he was delighted: "We always preferred it to be a TV show. We had talked about this and realised it wouldn't work as a movie, because it was too epic in scope. If it was a movie, it would have been just another zombie movie." British actor, Andrew Lincoln, was cast as the main character Rick Grimes, a policeman who wakes up in hospital to find the world in disarray and his wife and child missing. He sets out to find them and encounters numerous zombies on the way. Mr Adlard said the plot centred on how a disparate group of people cope in an extreme situation and how their characters develop: "That's what makes the book interesting, not the zombies." The first series of The Walking Dead was launched on the American television network AMC at Halloween. 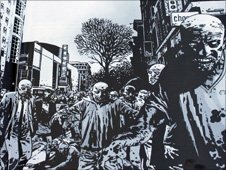 Mr Adlard went to America to see the series being shot and actually appeared in an episode as a zombie: "It's an impressive show and everyone seems to be going ballistic over it." He saw the rushes of the first programme but it was only when he saw the finished product that it all made sense: "When I saw the pilot it just felt like everything I'd seen, but strung together in the right order." He missed out on the premier of the show because he had too much to do: "I've been sat here in my studio in Shropshire just getting the comic done." He's hoping to be able to go over to America to see the filming of the next series of the show.